Do you have breast milk to spare? Here is what you need to know about finding a milk bank and donating your stash to a baby in need. If you produce more than enough milk for your own baby, you definitely don't want that liquid gold to go to waste. The good news? You may be able make breast milk donations to one of the many human milk banks in North America that supply milk to vulnerable babies—generally, premature and low birthweight babies. The mothers and doctors caring for vulnerable babies do whatever it takes to reduce the risks associated with prematurity, low birth weight or any other conditions that may result in a NICU admission. Due to a compromised immune system, these babies are at a higher risk of developing infections, and they have an increased chance of complications like vision and hearing problems, cardiovascular disorders, respiratory distress and more, according to the National Institutes of Health. Donating breast milk lets you play a role in giving them their best chance at a healthy future. Even though the need for donated breast milk is great, there isn't always one nearby. But don't let that deter you from becoming a donor: Once you become an approved donor, milk banks will provide the right shipping materials to keep your donation safe en route. Use the location finder available at Human Milk Banking Association of North America to find the one nearest to you. 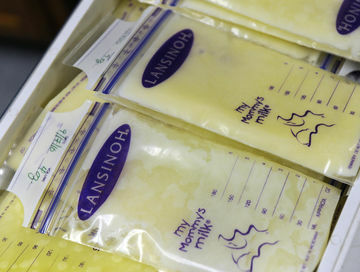 HMBANA is a nonprofit milk bank that accepts donated breast milk, and gives the milk only to babies who have a prescription from their doctor, according to Sarah Long, the director of clinical operations at The Milk Bank, a HMBANA milk bank in Indianapolis. This means you can be confident that any milk you donate will be used by the babies who need it the most. "Much like blood donation, we have to do screening," Long told Fit Pregnancy. "Ours is a little more rigorous. Not only do we perform a blood test to check for communicable diseases, we also require a medical and lifestyle history." The information they're most interested in is what kind of medications you are taking, if you consume alcohol on regular basis, and basic dietary habits, according to Long. What disqualifies a milk donor? It varies a bit from bank to bank, but many of the banks share common guidelines. Moms who take certain medications, who drink regularly, or have certain health conditions, like communicable diseases, will not be able to make donations. "We're not saying that your milk is not good enough," explains Long. "We know it will be fine for your own breastfeeding infants. But for our purposes, because the milk is for fragile infants, we have to ensure that the milk is as safe as possible." Once you have completed the initial screening, you'll be asked to sign a few consent forms and you will need your care provider to sign off that you are healthy and a suitable candidate for breast milk donation. Your baby's pediatrician will also need to confirm that your baby is healthy, getting plenty of milk, and gaining weight at an appropriate pace. As a milk donor, you will be ask to follow the same basic cleanliness standards you are taught when you are expressing milk for your own baby, according to Dr. Barbara Carr, a neonatologist at Saint Luke's Hospital and one of the founders of the Saint Luke's Heart of America Mothers' Milk Bank. That includes washing your hands well each time you pump, cleaning your pump parts with hot, soapy water and sanitizing your pump parts daily. You will also be provided with milk bags or sterilized bottles, which you will be asked to pump into directly to avoid contamination. Any breast milk you plan to donate should be frozen as soon as possible. Most milk banks will accept milk that has been in a deep freezer for less than six months or the freezer of a refrigerator for less than three months. And you will likely need to store it for a little while: Most banks ask you to make donations of at least 150 ounces at a time to cut back on the cost of shipping and processing the milk. Milk banks associated with the Human Milk Banks of North America make donating milk as simple as possible. If you're shipping your donation, you will be provided with all of the shipping materials and labels, so there will be no cost to you. To avoid infection and to maintain your milk supply, Dr. Carr recommends pumping or nursing every two or three hours, and making sure you are emptying your breasts each time you pump. "The most important thing is to make sure you are emptying your breasts each time you pump," advises Dr. Carr. "If you don't empty your breasts fully, you are at much higher risk of getting clogged ducts, blisters, or mastitis." Eating well and keeping yourself hydrated should be a top priority. Like any breastfeeding mom, you will need to consume extra calories while you are donating milk, and make sure you are caring for yourself while you are breastfeeding for two (or more!). If you take care of yourself, you'll be more likely to be able to offer this amazing contribution toward your own baby's growth—and the growth of other babies, as well.